What we have proved, abjure. But one thing still is sure. By the Square of the Speed of Light." Asserts that the circle is round. What is the state of our sacrifice? Mousing in Hell amid fire and ice? Still prowling the box with meow or purr? Or a superposition, a sort of splice? When does the damned collapse occur? To explain how defining "phenomenon"
Will resolve our dilemma in a trice. "Alive or dead? Yin or yang? Snails, or spice? May we not ask you to be precise? Returns, will we see him not once but twice? A double image that seems to blur? If he tells us his news, will that suffice? Let Einstein be!" restored the status quo. Faber and Faber, London, 1942. And long 'tis like to be. Henry Holt, New York, 1922. The figure which may have led you to these rhymes of science is a symbolic image, due to Jie Qi, of the Schrödinger cat paradox. 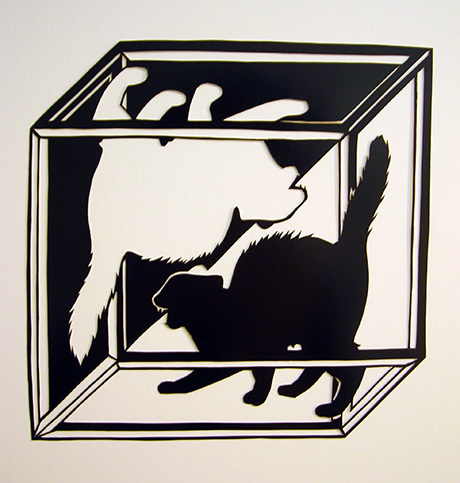 Here the usual box in which the cat is imprisoned is replaced by an impossible cube. Schrödinger's cat is of course also the subject of the poem "Ballade of the Copenhagen Interpretation" above.